Pick & wash rice till the water runs clear. Drain & let the rice soak & rest for about 20 mins. Now heat the pressure cooker body with oil till hot. Add the slice onions & fry till crisp & golden brown. Drain completely & set aside for garnishing. In the same oil add the whole garam masala (spices) & let it splutter & give out a good aroma. Now, if you want to prepare your own caramel then add the sugar & cook till it carmelizes to a dark color. Make sure it does not burn. Add the soaked rice & sauté gently till the rice is well coated with oil & is separate & not sticky i.e. the rice should be not raw but fried well. Now, if using prepared caramel then add the liquid caramel & stir to mix well. Then add sufficient water & salt to taste to the rice. Stir well & let it come to a boil. Then fix the cooker lid & the whistle. Steam upto 2 whistles. Release steam immediately. Open the pressure cooker & let the rice rest for about 5 mins. 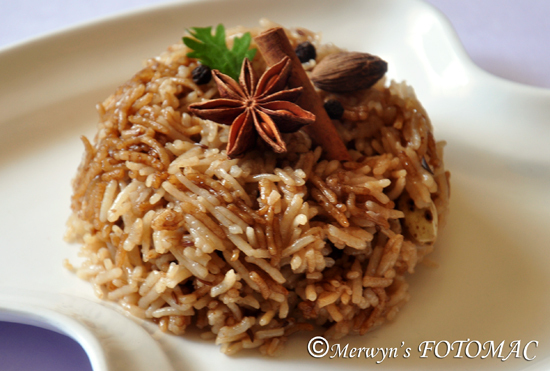 Drop one teaspoon ghee around the sides of the cooker body & on top of the rice. Do not stir. Let the rice turn warm & then gently separate the cooked rice grains with a fork & toss lightly. Garnish the brown rice with reserved crisp onions. 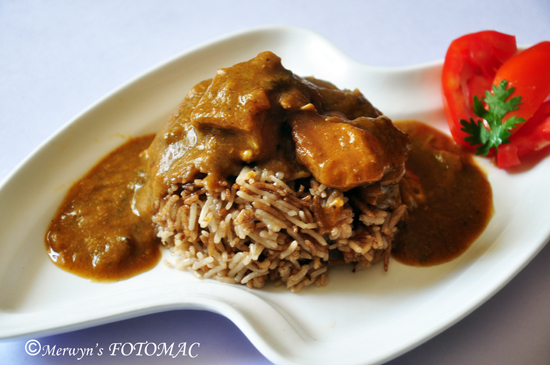 Serve the Caramelized Brown Rice with Dhansak. I hope to find all the ingredients to prepare it in my city, because this looks delicious and I can't wait to try!